ATV riding, star-gazing and spa-ing. Oh my! 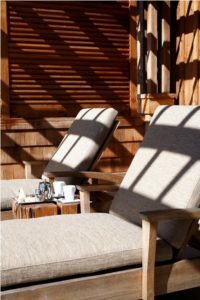 Nearly 3,000 feet above sea level in the captivating Blue Ridge Mountains of Virginia lies Primland Resort, a sprawling, luxury getaway, already popular with huntsmen and business elite, now emerging into the spotlight for spa enthusiasts. 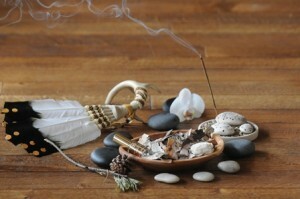 Still, its remarkable Native American-inspired spa is just one among an array of options for active vacationers. Primland is located just beyond the North Carolina border, an easy drive from Charlotte, Greensboro, Raleigh-Durham, Richmond, Roanoke and Washington D.C. − ideal for weekend getaways. With its bounty of outdoor activities (notably, golf, horseback or ATV trail riding, hiking, mountain biking, as well as hunting) Primland is foremost a playground for adult leisure that can make you forget everyday life. I traded New York City’s grind for a few days in the pleasures of the great outdoors (and an other-worldly spa experience) to discover thrilling, open-air adventures while “coming home” to stunning, sustainably luxurious accommodations with soul-satisfying views. Throughout the elegant 72,000-square-foot lodge, which is the focal point of the compound, there is a beautiful balance between nature and luxury. An understatedly elegant interior, with vaulted wood ceilings and wood beams is the signature decor. Certainly my “dream bathroom” was inspired by the wood, stone and deep soaking tub in its palatial, modern master bath facilities. 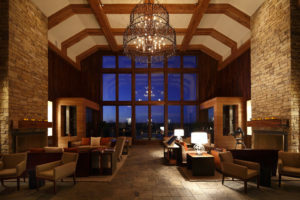 Also inside the lodge is one of the most unique features at Primland − a private observatory dome where each night a resident astronomer presents “A Tour of the Universe,” granting guests the rare opportunity to gaze upon stars, planets and other celestial objects 27 millions of light years away. 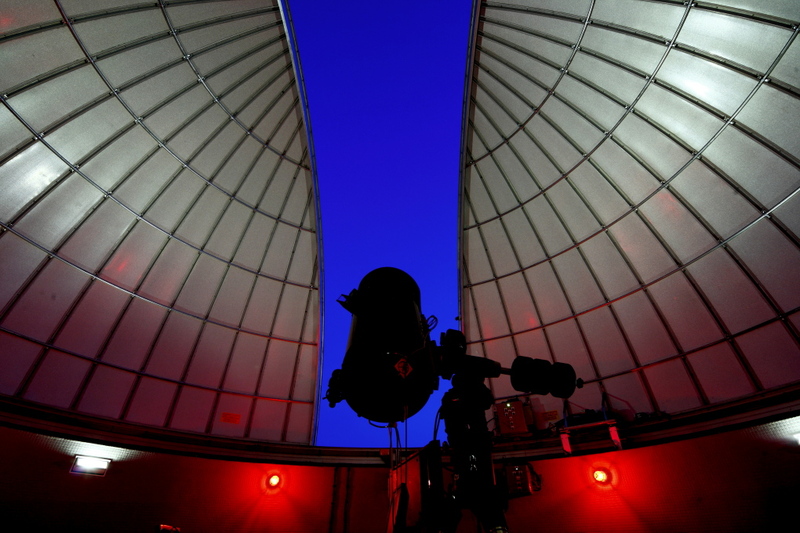 A powerful telescope in center of the dome, the only one of its kind available at a U.S. resort, enables unimaginable views. 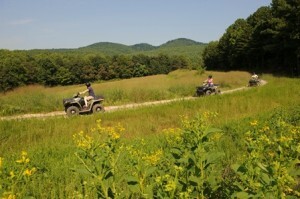 As rookie adventurer, I was excited to experience ATV trail riding. I was outfitted in mud-proof gear provided to me, and after a few laps around a parking lot on my ATV, I was confident and pumped – the key ingredients for a successful ride! Around streams and through the woods we went; I traversed over 20 miles of the expansive property from a variety of heights and panoramas. My guide was quite knowledgeable of the area and patient with a city-girl-gone-country. He was devoted to the community and upkeep of Primland and, like most of the warm staff I met, he hailed from nearby rural Virginia. 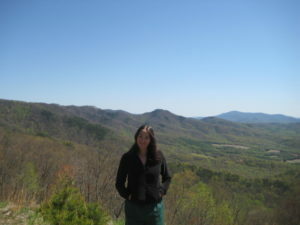 Once in adventure mode, I learned about clay shooting and geocaching, a high-tech treasure hunt played with GPS devices. The new sport is particularly popular with children, offering an innovative way to learn about the abundant flora and fauna. On my beginner trail trek, I caught sight of at least four deer. Other outdoor recreation includes: bird watching, sporting clays, fly-fishing, horseback riding, tennis and even tree climbing. 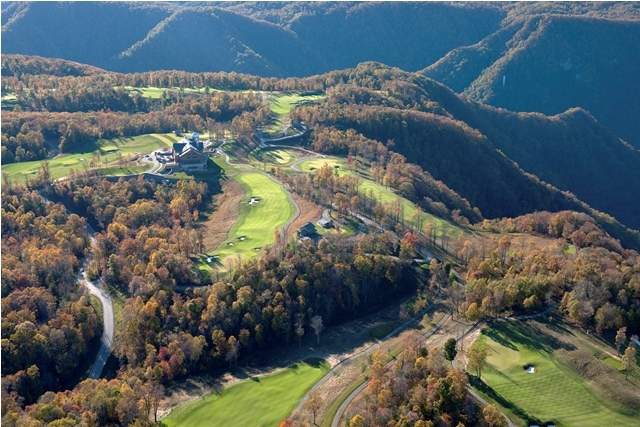 For many of Primland’s visitors, golf is the main draw, especially for golf aficionados. The Highland Golf Course has a distinguished reputation and earns top awards each year from major golf publications; it has also been named best in the state of Virginia. The designer course is said to resemble the Scottish Highlands as it winds its way around the mountain landscape, creating what even professionals deem a challenging terrain, accompanied by inspiring views. 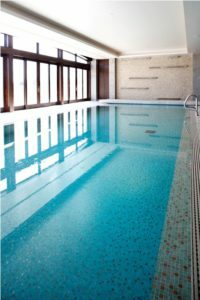 The Spa offers several treatments especially for players, including the Golfer’s Foot or Hand Renewal (45 min each), designed to increase circulation of the feet and to protect and hydrate the hands. 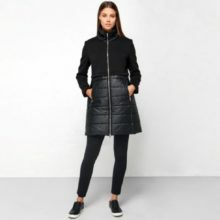 Additionally, a three-and-a-half-hour Before and After Ritual is offered for those who seek a vigorous prep such as a salt scrub and sports massage before a round of golf, followed by a mud wrap and deep tissue massage once the game is done. 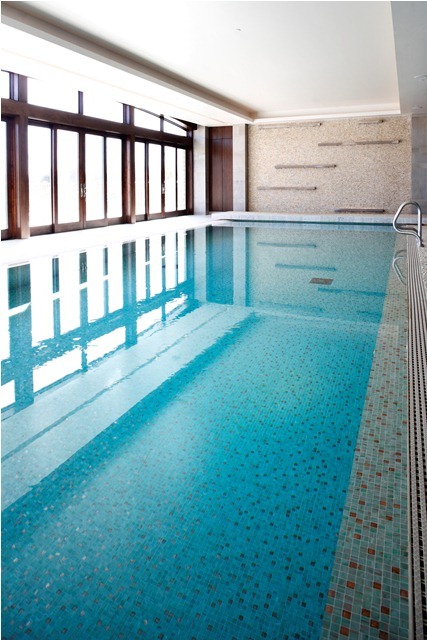 Everything from the locally sourced wood, stone and marble interiors to the peaceful music in the spa was thoughtfully chosen to soothe the senses. Additionally, turquoise, believed to be a spiritual element by Native Americans, is used in the spa’s decor and in several treatments. The stone is symbolic of a piece of sky fallen on earth, creating a link between the heavens and the earth. The 90-minute Stone of Eternal Youth Facial, which combines facial massage techniques with turquoise stone (believed also to soothe and regenerate the skin) is one of over 40 treatments offered. The Healing and Hot Stone Massage includes the use of features, chimes, crystals, stones and essential oils to create harmony of the mind, body and spirit. I experienced the Blue Corn and Honey Wrap & Float, a body therapy that begins with a gentle scrub. My skin was then nourished and moisturized with warm honey – a super food nutritionally and for the skin. 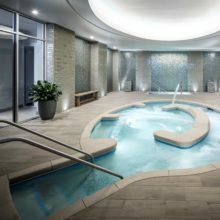 I “floated” in a cocoon-like state on a unique Soft Pack System™ that adjusts to the body, while the natural honey penetrated my skin. The feeling of weightlessness was incredibly calming and easy on the joints. Decompression comes easy in a relaxation room unlike any I’ve seen, with ceiling-height windows that overtly weave the sense of place into the space. While lying on a chaise lounge sipping my tea, I felt transported into nature, enveloped by the bright, beautiful surroundings. The calmness and energy of the outdoors seems to penetrate. 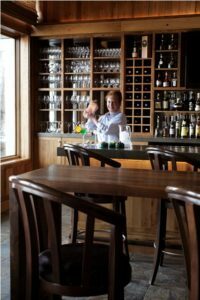 The key dining options at Primland are Stables, with a casual fare, 19th Pub, with a classic pub menu including a Kobe pimiento cheeseburger that regulars rave about, and Elements, a French-inspired, refined dining experience with cuisine utilizing seasonal farm-fresh ingredients and locally grown, organic meats and fish. I hadn’t even left Primland and I was conceptually planning my return; certainly if I was falling in love with this special place then chances were that my “guy’s guy” would as well. I could spa, while he golfs or discovers clay shooting. For those pursuing traditional “his & her” interests, together or independent, this resort has it covered as both a sporting retreat and a restorative, luxury destination. The continually updated calendar of events at Primland has in the past included special weekends such as ladies target and shooting school and starmaster packages. Coming up later this week is Old Appalachian Trail Day, which celebrates the six-mile section of the original, historic trail which cuts through Primland. For travelers – from romantics and adventure couples to girlfriend getaways and families – the experience at Primland can only be matched by its beauty. It seems there is something for everyone to do or discover in a magnificent, natural setting, tucked away in the Virginia wild. I experienced blissful days of adventure and rejuvenation as New York, as the rest of the world felt, well, light years away.